An open style kitchen floor plan provides room for kitchen islands and countertops. Traditionally, the kitchen was a workspace tucked away in the back of the house. It had room just enough for the essentials. In recent years the kitchen has increasingly become the focal point of our homes. Walls have been torn down in favor of open floor styles that share space between rooms. Some homeowners still embrace the past, however, in favor of a more closed-off layout. How do you know which style is right for your kitchen? Here’s a closer look. There are a number of key advantages to opening up your kitchen. Namely, you’ll have more space for entertaining family and friends. Instead of overcrowding in smaller rooms and having an impasse where everyone is trying to get to the kitchen for food, you can leverage the counter space to make your kitchen the go-to spot during parties and informal gathering. You also won’t be disconnected from social activities while you’re trying to prepare. Furthermore, open floor plans allow more room for an island or peninsula with more seating and counter space. Considering that your dining and living rooms usually have the largest windows with nice natural light, this is a way to bring additional natural light into your kitchen. By removing the walls you can create a far more luminous and inviting space. Of course, open floor kitchens aren’t without any drawbacks. There are a number of reasons a homeowner might want their kitchen to be closed off. With a closed kitchen design, you get the benefits of having more privacy. Should you decide to clean up at a later time, the mess is contained into one room away from your other living space. Your dining experience in a separate room can be made more formal with a closed kitchen and unwanted cooking odors will be sectioned off from the rest of your home. More walls also means you may have more upper cabinetry storage and room for appliances. There’s no set formula for determining which layout is better for your kitchen. If you do a lot of informal entertaining, you might want consider an open floor plan. If you’re looking for more privacy, a closed kitchen might be better. 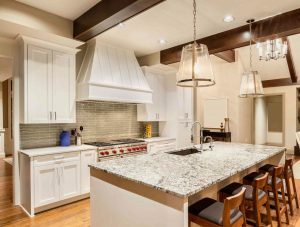 Having a conversation with your kitchen remodeling designer is the best way to start figuring out what’s best for your home. Remember, everyone’s needs are different so don’t get caught up in trends. This entry was posted on Friday, September 23rd, 2016 at 2:28 pm. Both comments and pings are currently closed.